The Netgear C3000 (aka C3000-100NAS, C3000v2) is the slower version of the C3700, having N300 Wi-Fi for speeds up to 300Mbs at 2.4 GHz. The C3700 is the same device but has N600 Wi-Fi for speeds up to 600Mbs. 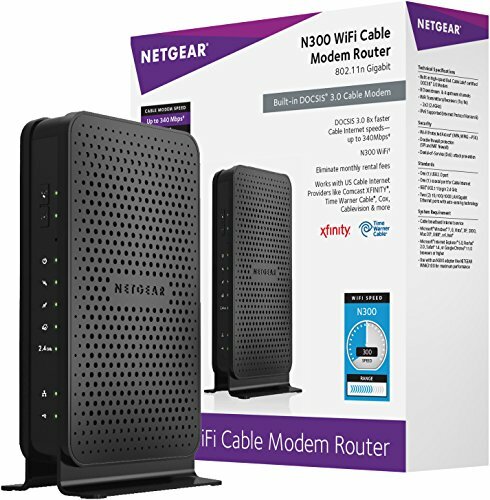 This modem plus router has two Gigabit Ethernet ports with auto-sensing technology and works with most cable internet providers, but is not compatible with cable bundled voice services. There is also one USB port and the C3000 supports IPv6. This well-known brand is highly rated for reliability and connectivity but comes at a steeper price than other brands.